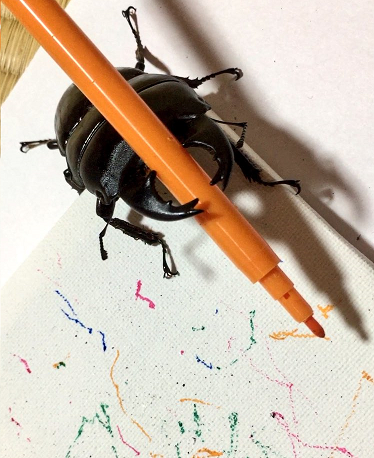 Spike is a very special stag beetle. Spike has always been special to his owner, but now, Spike is known around the world. A strong little guy, Spike can hold all manner of objects in his mandibles, including markers. A few scribbles on a canvas, and his artistic career began! Spike is more than just a blossoming artist, though. He’s an ambassador to the insect world, hoping to show others that “creepy-crawlies” aren’t all that creepy. They can be funny, cute, and full of personality. Want to know more about Spike? Want to own some of Spike's original works? Check out his shop for auctions and merchandise.